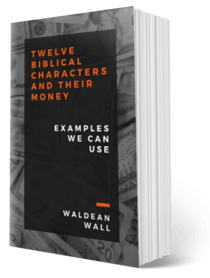 Twelves Biblical Characters helps us live with money through stories in the Bible. We can fool everyone around us and meet the best expectations of society while still being lost. Like Judas, we can walk with disciples and lose eternal life. To say this is difficult is an understatement. In this story we see the Word expose a rich man’s heart. Jesus encountered a wealthy man – sometimes we call him the rich young ruler – who sincerely wanted to be faithful to God and accepted by God. And based on his commandment-keeping (we’ll take this at face value), he was a very good man (In Matthew’s account of this encounter we also see the critical, love-your-neighbor-as-yourself element). If he was even close to the man he thought he was, he was amazing. I’m sure he had a fantastic reputation. Despite all of this, the man was insecure and perhaps afraid. He was unsure as to whether he was on the right path. At a minimum, he was trying to make sure he hadn’t missed anything. He may have known that his good works could not make him good enough. And it’s possible that he even knew the answer to the question he was going to ask. Regardless, now Jesus was near and he could know for sure. One of the interesting things about this story was how Luke took the time to tell us about this man’s response. The man became sad when Jesus told him to sell everything. Instead of arguing or dismissing Jesus, he responded as if he knew who Jesus really was and he knew that Jesus had it right. He was deeply moved, but he still didn’t leave his money. What was Jesus doing with this man? Jesus was bringing this man face-to-face with his god. In the commandment-keeping that Jesus initially asked about, he didn’t ask if the man had any other gods that came before God (the first commandment). Can you imagine the response if he had asked that? I’m sure this man would have denied any other loyalties. So, Jesus directly confronts this man’s idolatry by making sure he knows that this god, money, must go. If we’re to have a right relationship with God, there is no room for idols. God must be our God. This man should have dropped to his knees in sorrow, confession, repentance, and worship. But he wouldn’t do it. This story reminds me of a discussion I had with a young man who was on the wrong path. He was sexually involved with a girl who was pulling him away from everything he believed. As we talked, he began to cry. He recognized the problem and desperately wanted to do the right thing and follow Jesus. And I remember the next sad event as if it happened yesterday. As he picked up the telephone for his break-up call, he looked at the phone for a few moments and then put it down. He couldn’t and wouldn’t leave his idol. What’s with the camel analogy? Is it more difficult for God to save a rich person than a poor person? That’s not what Jesus said. He’s not comparing the money-idol to any other form of idolatry. He is simply focusing on the strength of money’s deception and our inability to defeat it. Without the salvific call of God, the love of money will take our souls. The story of this rich young ruler, at least for Luke, is incomplete without the contrasting story of Zacchaeus (Luke 19:1-10). Here we have an amazing contrast between two rich people. While both were rich, the community loved one and hated the other. One was exemplary in his lifestyle, and one was reprehensible. One clings to his wealth, and one releases it. One is lost, and one is saved. The comparison of the rich ruler to Zacchaeus is not an accident. One of the strong messages here is that we can appear to be a good person who’s very close to God, and still be in idolatry. This was also the case with Judas. When Jesus said that one of the disciples would betray him, the disciples didn’t pick Judas as the obvious candidate. And it’s interesting that money was Judas’ god too. The rich young man in this story was trying to do the one thing that can’t be done. He was attempting to serve both God and money. The Bible is clear that we will love one and hate the other (Matt 6:24). We must all examine our thoughts and lives to make sure that God is our God.